The volunteer crew at work. Various cyclists are volunteering to help the city paint the bike lanes and make them safe. 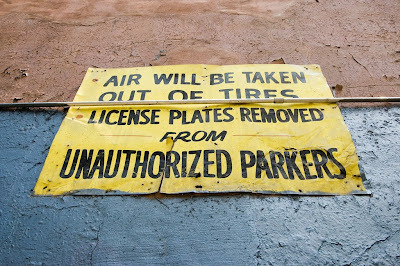 Air will be taken out of tires, license plates removed from unauhorized parkers. This is how New Yorkers say "Do not park here"
I bet it will work in Florence too! The brain is a wonderful organ; it starts working the moment you get up in the morning, and does not stop until you get into the car. ... for the greater good - and thanks! Missy sweet count your days. You won't get away for ever with parking in the bike lane. 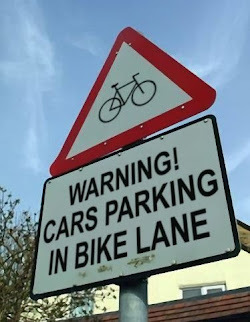 Cyclists should not have to worry about being hit by a car when trying to ride around a car parked in the bike lane. This fellow here obviously doesn't care about cyclist.